This image depicts a close view of the surface of an unidentified Petri dish culture dish growth medium, which had been inoculated with the organism Mycobacterium tuberculosis, highlighting the bacterium’s colonial morphology. 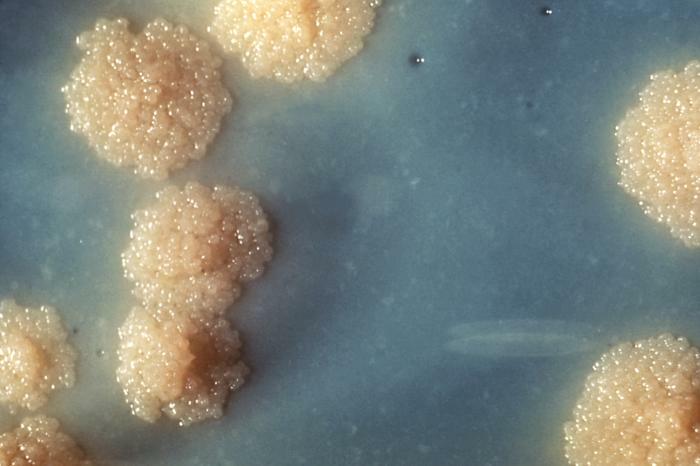 Note the colorless, rough surface, which are typical morphologic characteristics seen in M. tuberculosis colonies. Macroscopic examination of colonial growth patterns is still one of the ways microorganisms are often identified. Copyright Restrictions: None - This image is in the public domain and thus free of any copyright restrictions. As a matter of courtesy we request that the content provider be credited and notified in any public or private usage of this image.